Hey there, I’m Michelle Freedman, the current president of the Portland Modern Quilt Guild (PMQG) in Portland, Oregon. I’m here to tell you about an exciting project our guild has just announced. PMQG has teamed up with Shannon Fabrics to launch a new challenge to help support the arts in Oregon! Each guild member will be given a fat quarter of Kozy Cuddle to incorporate into a doll quilt of their own design. 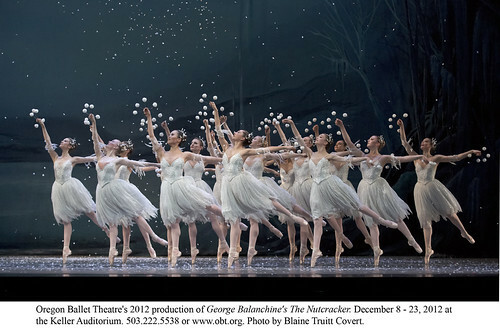 The finished doll quilts will be sold during the Oregon Ballet Theater’s (OBT) performances of Geroge Balanchine’s The Nutcracker, December 14th – 24th at the Keller Auditorium. Our Cuddle 3 colors: Red, Teal, Ivory, Paris Pink and Dark Lime were selected from a palette we created using the OBT ‘Welcome to the Land of Sweets’ artwork. This fresh, modern palette will inspire some exciting designs, no doubt! We were so jazzed about this challenge that we invited the Northwest Quilters to join in the fun. The two guilds combined have over 300 members who are donating their time, talent and creativity to this project. We hope to make lots of children happy this holiday season while supporting a wonderful arts organization.